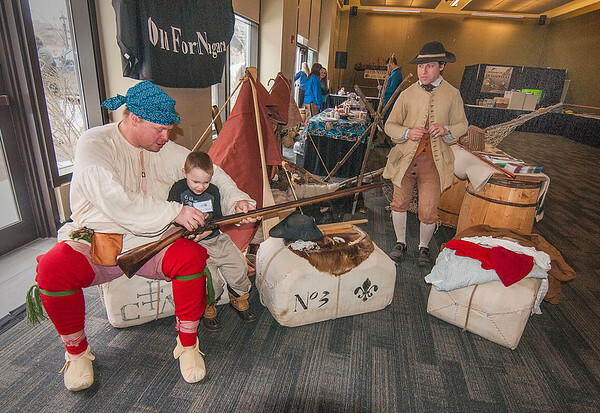 Niagara Falls, NY - Old Fort Niagara Interpretive Program Manager Jason Buckley, with Assistant Manager Brian McDonald, show young James Pattison, 4 of Erie, PA, a musket and other artifacts from the fort in the Family Fun Zone room at the Greater Niagara Fishing & Outdoor Expo at the Conference & Event Center Niagara Falls. Organizers said there is something for everyone including food, retail areas and a family fun zone. For more information visit http://www.NiagaraFashingExpo.com.